For those who don’t want to walk or would like to leave the Garden with a much better understanding of why Nieuwoudtville and the Bokkeveld Plateau are both so special and different from the rest of Namaqualand, a Guided Tour using our safari vehicle, aptly named the Hantam Explorer, is a definite must. 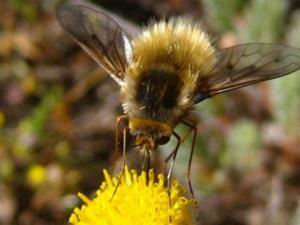 You will also learn more about the interaction between pollinators and plants, the various soil and vegetation types, as well as research going on in the Garden and much more. During the three flowering months of August, September and October, the Garden offers Guided Tours at R150.00 per person, weather permitting. 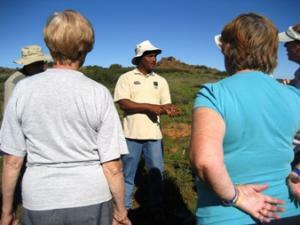 Booking is essential and no tours will be conducted for groups of less than 5 people. The safari vehicle (that seats nine) leaves the office building at 14:00 on fine days and lasts approximately two and a half hours. Booking is essential to avoid disappointment, but please feel free to come and enquire at the office about vacant seats if you did not make a booking. Whatever you decide, enjoy the Garden and appreciate its uniqueness. Visitors will be treated to a display of an astounding variety of bulbs and annuals that can occur in vast profusion, producing an intricate floral tapestry of unrivalled richness. “A sincere thanks for the fabulous tour we all enjoyed with you on Sunday afternoon. 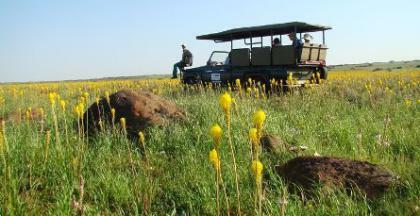 We felt privileged that our group was the first to use your new up market and comfortable “game viewing” vehicle. Your knowledge and passion for the flowers of your area is felt so intensely by everyone on tour with you. There was such a lot of positive discussion on Saturday evening after the tour and our sincere thanks for a wonderful afternoon spent in your company! I will be in Nieuwoudtville next year and look forward to coming again – in fact, I might even market a “March” flower tour!….I personally would love to see these magnificent flowers in display!